Today's Times-Standard alerts us to the fact that the latest edition of California Department of Justice's crime statistics for the year 2009 have just been released. That, plus a similar release from the FBI, tells us that it's time to update the chart we published back at the beginning of May, in response to one of incumbent District Attorney Paul Gallegos' campaign planks -- that the crime rate has fallen to new lows under his watch, and that he and his office deserve the credit for the drop. The evidence for the claim was pretty thin back then, but given the customary level of hurlyburly and hype in any political campaign, we judged this particular piece of hokum in bounds. Today's news, though, is egg on the face. 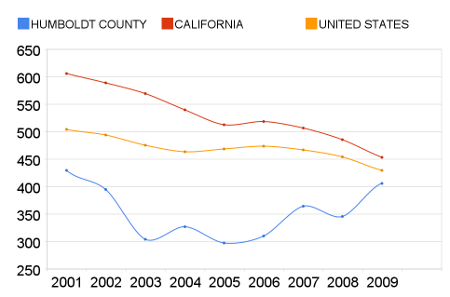 Following a dramatic uptick last year, the violent crime rate in Humboldt County as of 2009 was higher than when Gallegos took office. The rates in California and the nation at large, meanwhile, continued to fall. So you can expect this particular plank to vanish from Gallegos campaign literature as we move into the November runoff. Again, all's fair in love and politics. What doesn't seem quite so seemly is Gallegos sloughing off last year's big bump to the Times-Standard's Matt Drange. Yellow flag! You don't get to claim sole credit for lowering crime rates if, when they rise, you say that it's all someone or something else's fault. You do the crime, you do the time (as it were).